Bring a small saucepan of salted water to the boil. Add the pearl onions, reduce the heat to low and simmer until tender, about 15 minutes. Remove the onions from the water and set aside. Melt the butter with a splash of oil in a wide pan over medium heat. Put the chicken pieces into the pan in a single layer and season with sea salt. Cook the chicken slowly, turning occasionally until the skin is golden brown - about 5 minutes. Pour off any excess fat at this point. Put the chillies in a bowl with 500ml boiling water and soak for about 30 minutes. Remove the chillies, reserving the water, and roughly chop. Blend or process the chillies, garlic, cumin and the chilli water until smooth. Add the chilli sauce, bay leaves and orange rind to the chicken and stir with a wooden spoon, scraping any brown bits stuck to the bottom of the pan. Reduce the heat to low, cover and braise the chicken until it is tender and the sauce has thickened a little - about 30 minutes. Return the pearl onions to the chicken to heat through. Remove the bay leaves and orange rind, adjust seasoning if necessary. 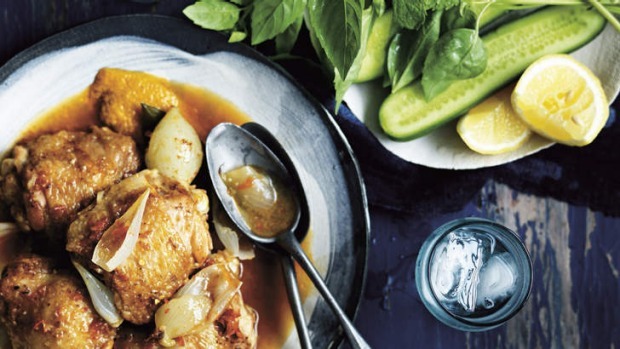 Divide the chicken among 4 large bowls and serve with steamed jasmine rice and cucumber salad. • The chicken can be replaced with seafood - thickly diced blue eye or whole prawns - but they will take only minutes to cook. • You may want to cook the seafood, then remove it to allow the sauce to reduce. • Pork belly is also a delicious option for the braise - cut the pieces large and render them slowly for about 30 minutes, then pour off the fat before continuing. The belly pieces will take about 1 1/2 hours to become tender. • The salad is adaptable - ramp it up with some toasted almonds and finely sliced shallots, or add finely sliced raw zucchini and mushrooms. The mild heat of the chicken dish is best balanced by fruit-rich flavour, not sweetness. The fresh nashi pear and white floral notes of the 2011 John Duval Plexus MRV (marsanne, roussanne, viognier) from South Australia's Barossa Valley ($25) do the job nicely. A gentle oak flavour highlights the chicken and cumin. Photography by William Meppem. Styling by Hannah Meppem. Food preparation by Kirsten Jenkins.